Picasso met Jacqueline Roque in 1953, when he was 72 and she 25. The beautiful young woman would become his model, his mistress and, in 1961 his second wife. 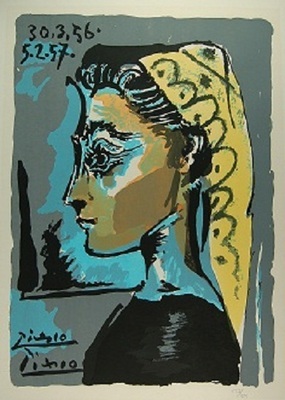 As his muse she was destined to be the subject of hundreds of portraits; as his last wife she was not only the jealous chaperon of the aging artist (isolating him from the children he had with his former partner, Françoise Gilot), she also played a significant role in the intricate progress of the artist’s legacy. It proved to be such a weight on her shoulders that she committed suicide in 1989. This lithograph, after a painting, portrays her with a yellow head dress seen from the left, a very typical pose for the painter. So typical that it is not always easy to identify his models, going in these years from Françoise via Sylvette to Jacqueline. In terms of style this confirms the descriptions of Pablo’s volatile loyalty to women, which contributed to the success of Gilot’s bestselling book A Life with Picasso, 1964 (and ruined for good her relation with the painter). A study for the present work identifying the sitter was used for the poster of a show in the same year. Perhaps this lithograph was proposed for the same event.